56302-RB is rated 5.0 out of 5 by 2. Rated 5 out of 5 by Scorpio51 from Has great features I really like the handheld in our recently remodeled shower. It allows me to shower and adjust the handheld to the desired height. Great for bathing grandbaby or even our dogs. We have a bench in the shower so can sit or stand according to the height. Rated 5 out of 5 by Ingenicon from Better than any mere slide bar Combined this with a delta hand shower. Feels great and looks good with the stainless fixtures. All the benefits of a slide bar with the added value of safety. Where does the handshower hang on this model? There doesn't appear to be a place to attach the handshower. Do you have to have a wall mount for the handshower with the ADA compliant slide? Thank you for your question. 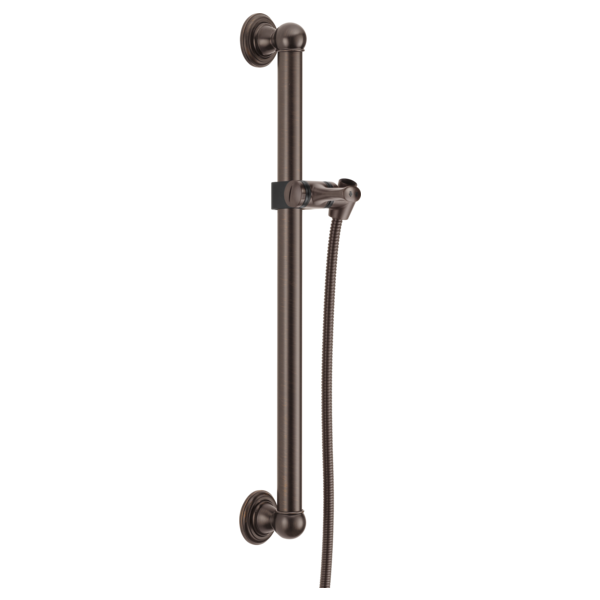 Delta Faucet model # 56302-RB has a bracket included in the package that has a spot for you to hang your handshower. Thank you for your question. Delta Faucet model # 56302-RB will require a handshower and a wall elbow in additon to a valve to complete the set up of the faucet. Can the hand shower be detached from the grab bar to be used in other areas of the shower and then remounted to the grab bar? Thank you for your question. Delta Faucet model # 56302 can have the handshower removed and used in other parts of the shower and then replaced. Are there coordinating products for the shower such as: 15&quot; or 18&quot; grab bars, shower control? Thank you for your question. Delta Faucet model # 56302 is a 24 inch grab bar. We do not manufacture grab bars smaller than 24 inches. I need a mounting diagram or a dissambly diagram because i cannot see the seam of the escuteon in order to access the three holes in each wall mount? Does the bracket that holds the shower head swivel up and down? Will it hold this position while a person showers? Thank you for your question. Delta Faucet model # 56302 does not swivel up and down. It can be moved up and down and then locked into place while the user takes a shower. Is there a 18&quot; ADA Grab bar that matches bar 56302?